The name hit me upside the head as I turned the page of the Fort McMurray Today from last Friday (July 8, 2011). Nestled at the top of the column, the notice from the Operating Engineers Local 955 was in the place reserved for those who have met their end. 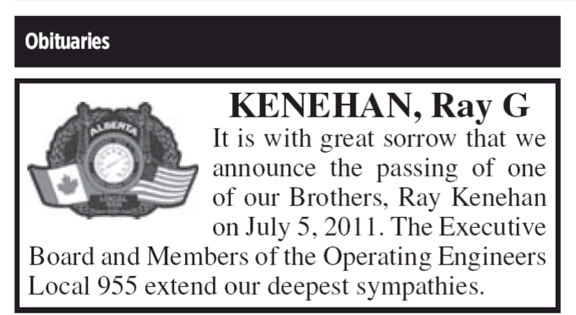 Ray G. Kenehan had died on July 5th. Ray. Old Ray Dog. A long time ago, before I met Heather, when I was in my second year of owning this house, every bedroom was being rented out; I needed the income to be able to pay the mortgage. 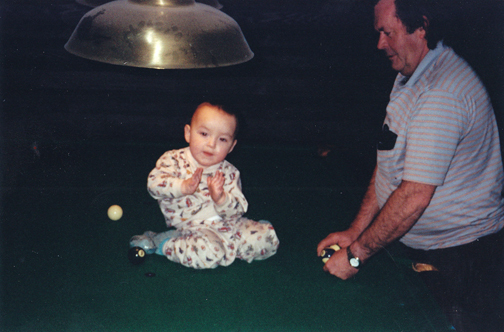 There were only two exceptions: the master bedroom and the one occupied by my one year old son Dylan. Ray showed up in 2000 and stayed a resident for at least two, possibly three years. He was there as my relationship with Dylan's mom came crashing to the ground. He was there as I recovered from Achilles tendon surgery, an injury I suffered on stage in the fall of that year playing Biff in Death of a Salesman. He was there as I was a single father on one leg, trying to take care of a one year old son who, with mild cerebral palsy, was also unable to walk. We were quite a pair, or a trio if you include Ray. 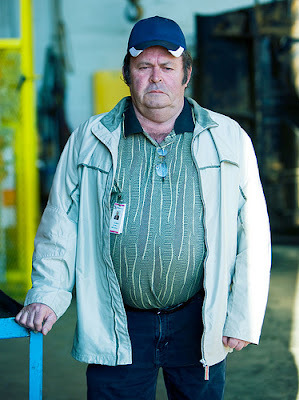 He was a truck driver from Ontario who struggled with his twin demons of drinking and gambling. At his best Ray would send the bulk of his pay home to his wife and kids; at his worst he would gamble it away hours after cashing his cheque. When he was working, he worked hard and worked clean. When he was left with time off, he struggled to stay away from the bottle and the local casino, too conveniently located a couple of blocks from our house. There are three things that stand out in my memory about Ray, things that I admired and appreciated. First, he loved his family. He often spoke of his five children and would express concern about being able to provide for them. He loved to talk on the phone with his siblings and would do so often. He also talked lots with his stepmother Trudy. Second, he loved country music. Ray liked the old stuff, names like Merle Haggard, Hank Williams and Waylon Jennings. 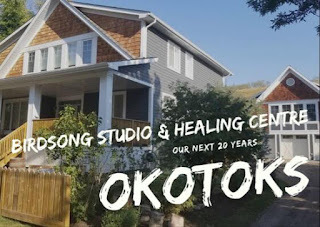 It was in the music that I believe he connected with the deep sorrow in his life, the inevitable emptiness that came from the choices he made and the demons he battled. Third, he walked softly and was gentle and kind during his long periods of sobriety. As he went about his business, either early in the morning or late at night, he was quiet as a mouse. I appreciated his stealthiness as many of the other roommates took the opposite approach to communal living. He was also good to talk to, willing to listen and eager to share. With Dylan, he was deferential and engaging. "Where's Yay?" Dylan would ask, still unable to pronounce the letter R.
We often talked about his struggles, of his desire to do right by his family, and of his longing to be closer to his kids. There is a song by T. Graham Brown that I will always associate with Ray and his lifelong journey that ended just a few days ago. It's called Water Into Wine. The words are powerful and probably can be applied to anyone who has battled with the bottle. In the end, we are left with whispers of memory and waves of feeling. Ray will always have a special place in my heart for being there during those interesting days when I was a single father with a very special son. He had a good heart, though in the end it failed him. Rest well Ray, in the warming breeze of heaven to a never-ending soundtrack of old fashioned country music, just the way you like it. 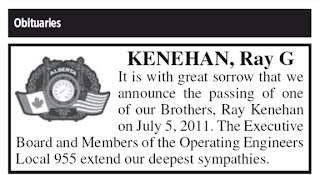 KENEHAN, Ray - 1949 - 2011. Passed away peacefully with his children by his side, on July 5, 2011 at the University of Alberta Hospital, in Alberta, in his 63rd year. Predeceased by his parents Gerald and Hannora, and stepmother Trudy. Loving father of Jennifer, Tanya, Lisa, Brandon and Michelle. Dear grandpa to Edan. Ray will be sadly missed by his siblings Shiela Thompson (Brian), Paul, Chris and Janice Moran, as well as many nieces, nephews other family and friends. I did not know Ray but I imagine that like me, many of us have had a Ray in our lives. The duality of his love of family AND the bottle, strikes hard. No, it is not my personal demon. Mine takes a different name and face. If we are honest, more folks could relate to Ray and his human factor than we know. It is that recognition through the eyes of one who saw Ray at his core, who brilliantly eulogized this man's short stint here on earth that has caused me to shed tears today. May we all be seen and loved the way you saw and loved Ray. Thank you so much Katherine. Your words encourage and inspire me to continue my writing journey. 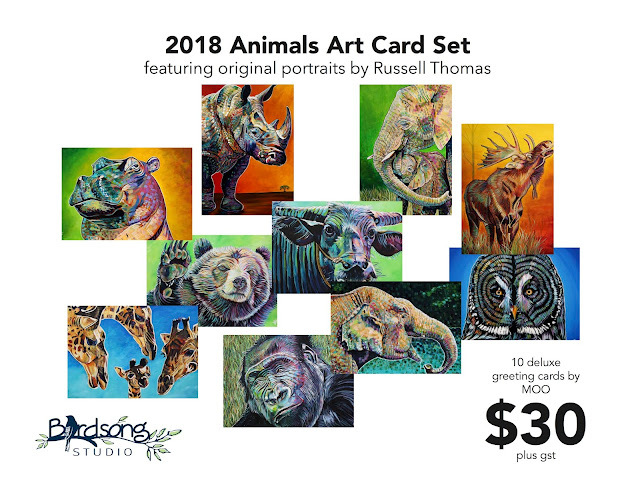 What a lovely tribute, Russell. Ray sounds very much like the rest of us, with all the strengths and weaknesses that make us human. Ray may be gone now but he obviously touched your life, Russell, and that of your son, and in that way he lives on to be remembered. I think remembering is the greatest tribute we can pay to anyone who has touched our life. Thank you for such a wonderful reminder to treasure those who enter our lives however briefly and change them, even in the tiniest way. To my old crew, the boys of Dyke 12, it was fun while it lasted. Thanks Anonymous for sharing that wonderful memory of "Razor". It certainly brightened up my day.